My tulips are finally up! I actually painted this to submit for a show at the library where I work; this year the Calgary Public Library is celebrating its 100th birthday and they have invited staff members to submit art for display at the central branch for the month of June. I was planning to do this still life set up anyway, but then since it is (hopefully) going to be for the library show, I decided to add the paperback and coffee cup. 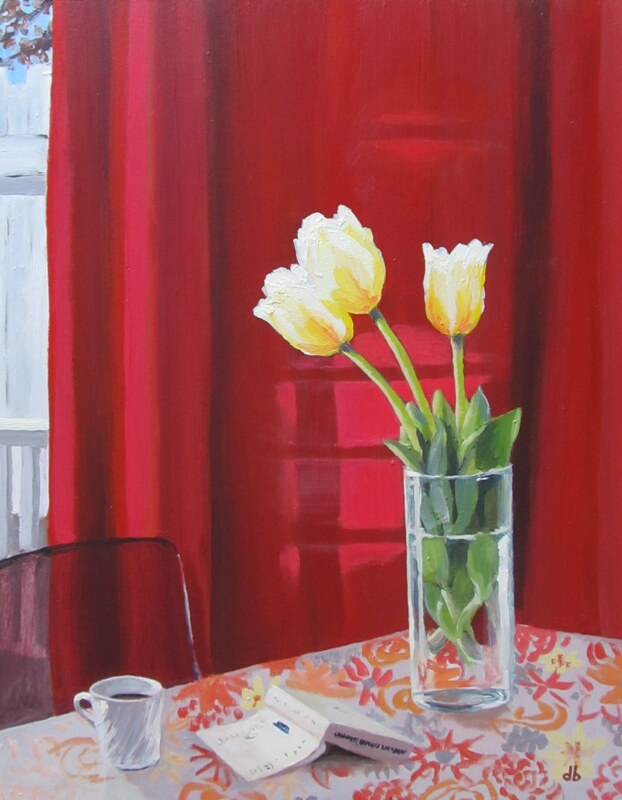 It is also an invented scene since the reflections on the curtains behind the tulips didn’t actually exist in the still life. When I thought I was finished the painting, I took it in the living room to look at it; and a reflection from the venetian blinds in that room was cast onto the painting. I thought it looked phenomenal so I decided to paint it into the painting. This is something I have been playing with for a while–photographing reflections that land on my finished paintings and then painting them–but this is the first (what I call “reflection painting”) that has been this successful. ← Watercolour Wednesday — On the Deck. Looooooove it!!! This looks like a perfect painting for a library! Love the book and coffee cup additions, love the reflections, just love it. It looks very inviting and relaxing. Thank you so much Pickle!